I received a “review” this morning, and just thought I would share. Thanks to all who have read! 600 people reached the top of Mt. Everest in 2012. This blog got about 3,800 views in 2012. If every person who reached the top of Mt. Everest viewed this blog, it would have taken 6 years to get that many views. When I was younger, I remember only having one or two best friends. I’m not talking about the friends that were around at school, I am talking about friends that I spent hours on the phone with, that had sleepovers and that would whisper in the halls about the boy they thought was cute. Because when you’re in elementary school, those are the kinds of friends that you need. Now, being 30 years of age, I realize that I don’t have any best friends. Now, before you start feeling sorry for me, let me explain. I have family. Not just my relatives by blood, but the family that God has delegated in my life. Friendships from church, from PTO, from work (I can include 3 year olds), even from Greeley Moms. I am a true believer that God places people in your life at just the right time. Sometimes these people stay, and sometimes these people are called to leave. Whether it’s leaving to another town, state, or even leaving this earth, saying goodbye is never easy. This week, Ray and I say goodbye (well, we’ll call it “see you later” because we are definitely visiting) to some of our closest friends as they start a new chapter in Hawaii. We owe a lot to our friends, Zach and Dennisa. These friends are the reason that we are so involved with our church(www.greeleymosaic.com), and through this we have been blessed beyond measure. This is where we have met most of our now cherished friendships. I’m not even sure if I have ever told them Thank You. Thank you for being friends when we needed them most. Thank you for making us laugh when we wanted to cry. Thanks for crying with us when we needed a shoulder. Thank you for being you. I’ll be the first to admit that we took their friendship, and time with them for granted. I think we can all be guilty of saying, “let’s plan to get together for dinner”, or “hey, I need to reschedule”…and it just doesn’t happen as frequently as it should. We got together when we could, but now that those opportunities won’t be as frequent, I feel like I should have made more of an effort. Now, that we know they’re moving, we have made sure to spend as much time with them as possible. Laughing, crying, and just making the best of our time together. I know Christmas can be a time of happiness for many, but also a time of sadness for many others. Whether it’s because of a loved one who is no longer here, or family that doesn’t spend the Holidays together anymore, Christmas time can be mournful. But, that’s not what it should be. So, can I encourage you this Christmas …don’t take your family, friends or anyone that you love for granted. Quit making excuses for not getting together. Pick up the phone. Even if it’s sending a text, tell those that you love what they mean to you. Don’t live in a life of regret. Life a life satisfied because you made the most of your relationships. For you never know what tomorrow might bring. Spend quality time with them making memories that will travel across the seas. For hopefully next year, Ray and I will be saying “Maliki Liki Maka” right alongside Zach and Dennisa. I’m sorry…just needed to vent. My heart is broken hearing of the tragedy at Sandy Brook Elementary School. Yes, an elementary school. I am sitting on my couch, inconsolable…and I know none of these kids, teachers, parents, brothers or sisters. My heart literally hurts. This week, I have been surrounded by events that have happened. Events that make people question, why? These events have opened my eyes to a world of pain, hate, sadness and loss. I’m no longer worried about the tiles falling off in our bathroom or our sprinklers not being blown out. It just doesn’t matter anymore…there are SO many people out there right now that are hurting much, much more. Yesterday, I attended the funeral of one very special woman. She left behind a husband, 3 young boys and a family who loved her very much. They are hurting. Looking at the pile of canned goods that our school has collected for families in need…wondering how they’re going to feed their family. They are hurting. Imagining these kids at Sandy Brook…18 of them who lost their innocent lives. Even the kids and teachers who survived will forever be haunted by this act of terror. Seeing photo upon photo pop up of kids who are in complete panic. Kids should never be a witness to anything like this. They are hurting. Watching the President hold a news conference, crying. We are ALL hurting. Yeah, my problems are pretty small. Tonight, when your kids aren’t eating their dinner…be thankful they’re home safe. Or, tomorrow when they’re throwing a fit because they want ice cream for breakfast…be thankful they still have their voice. Hug and kiss your kids a little bit extra, not only tonight…but everyday. May God bless everyone who is hurting. Today, Ray came home for lunch. This is nothing out of the ordinary…although I was a little embarrassed that he came home for lunch and witnessed me laying on the couch watching Toddlers and Tiaras. In my defense, I took advantage of “nap time” today by trying to take one myself…and hey, it’s quite easy to fall asleep during that show. Sigh…I’ve heard this many times before. Typically Ray and I try not to spend a whole lot of money on each other for Christmas. I would much rather spend it on the kids because we have a very tight budget. Anyway, there has been many years (I should have learned by now) that we decide not to get gifts for one another. One year, I had nothing for Ray. I didn’t even put anything in his stocking (I’ll blame Santa for that one)…and he got me a phone. But, my favorite is the year when we were still just dating and Ray was on the UNC cycling team. Again, that year we said we weren’t going to spend any money on each other! But I thought to myself, I’m going to surprise him this year and get him a gift! So I did. I got him socks and arm warmers (for cycling…I know). I was so excited to finally surprise him with a gift…when what did my wandering eyes did appear…AN ENGAGEMENT RING! Yeah, arm warmers were my gift to him. Arm warmers. That Christmas my heart was so warm, and well…Ray’s arms were warm. So, as you can see, today when I found out Ray got me a gift I was a little nervous. I know that there is still 2 weeks before Christmas, but again, we weren’t doing gifts this year. 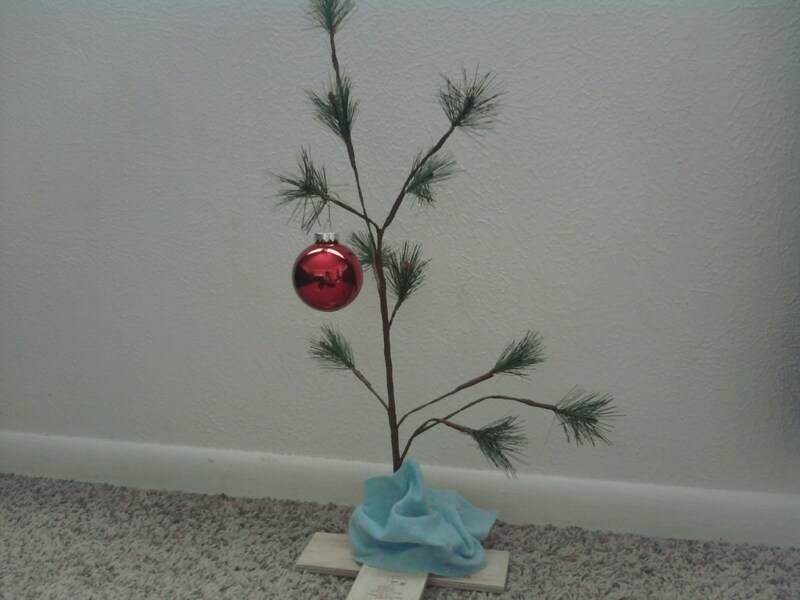 He held a box out in front of me and said, “This is to symbolize all of the Charlie Brown Christmases that we have spent together, yet you still love me. Because…it just needs a little love”. He did it again. This could be one of the most meaningful gifts that I have ever received. That’s what I love about Christmas. For us, it has never been about wanting or even expecting a gift from each other. What it has always been about is love. Spending time together as a family, and reflecting on all that we do have…not on what we don’t. 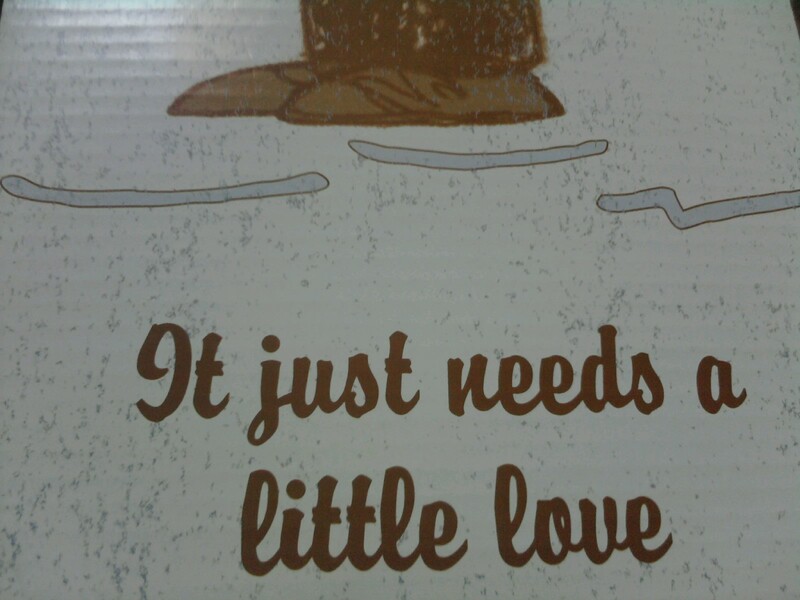 So, if you’re stressed out this Christmas season…just remember “It just needs a little love”.